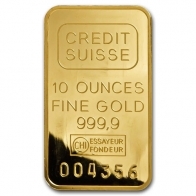 1 Ounce (Oz) Credit Suisse Gold Bullion Bar – 999.9 fine investment grade gold bullion. 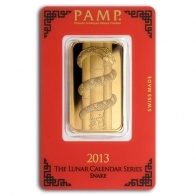 Each bar contains 1 troy ounce (or 31.10g) of 999.9 fine investment grade gold bullion. Credit Suisse are a world-renowned banking and wealth management operation. The renowned Swiss bank entered the precious metals market in the 1980s when they acquired Valcambi SA, one of Switzerland’s most prominent precious metals refineries. At that time, the bank was in the forefront of the precious metals investment trend, and was one of the first banks to introduce their own range of retail gold and silver bars. UBS quickly followed their lead. To this day, these two banks are the main financial institutions worldwide that have a name in retail precious metals products. Since that time, they have gained a reputation for high quality retail bullion products, and their gold bars are sought after worldwide. Each of these bars has been crafted to the high standard that is synonymous with Switzerland. 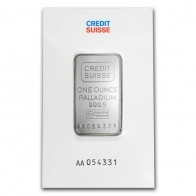 On the forward face of this solid gold troy ounce bar you will find the imprinted Credit Suisse logo with the weight, metal type, metal fineness and the serial number of your bar. 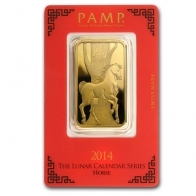 On the back of your individually cut and shaped gold bar will be a second imprint of the corporate logo. Both features are valid proof of the high-end, high-grade production of this bar. All Credit Suisse gold bars are sold sealed in their own blister pack (or certicard) to protect the gold bar. Gold is a soft and malleable metal and can easily be damaged if not protected properly. The certicard also features the Credit Suisse logo alongside the bar’s serial number, which helps validate its authenticity. Credit Suisse gold bars purchased from SwissBullion.ch are available for VAT-free Swiss storage or for delivery worldwide. Orders placed for Swiss storage may be requested for delivery or sold back at favorable rates at any time. SwissBullion.ch offers its clients free vault storage for their first year.